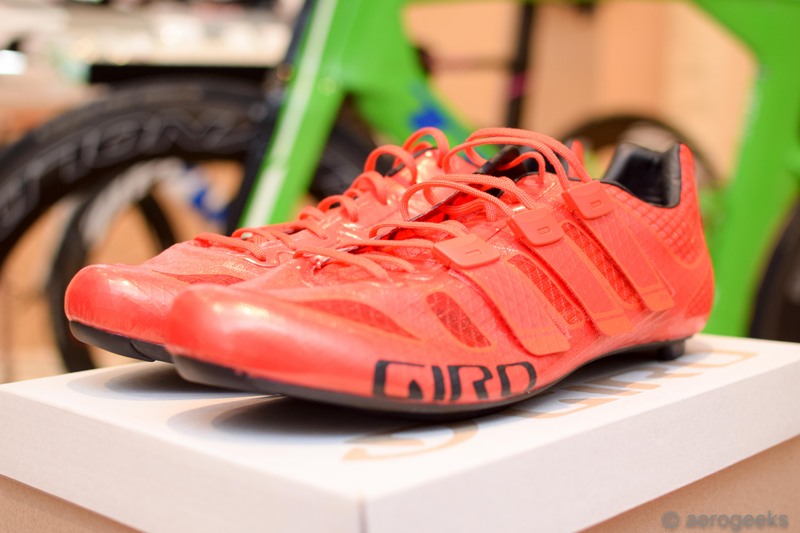 201 grams – that’s what our left foot size 47 Giro Prolight Techlace’s weighed in at (with the included Ultralight SuperNatural Fit Kit with adjustable arch support). For comparisons sake, a Toasted Marshmallow GU weighs 33 grams. So, go to your pantry and grab six gels and hold them in your hand. Now imagine that’s all the weight you have around your foot for 112 miles. That’s how light the Prolight Techlace is, and we have put the miles in to know if that low weight (and the high price) are worth it. 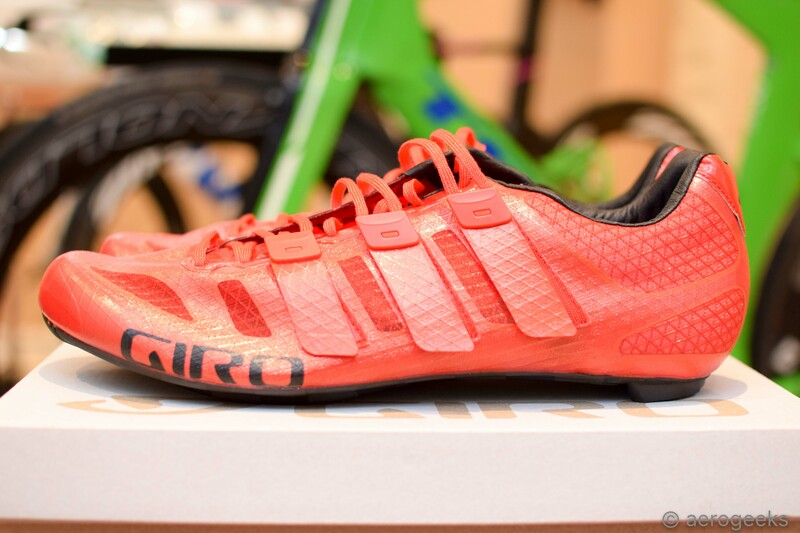 Giro designed the Prolight Techlace with three key features in mind. The Techlace Pro closure system combines the custom comfort and multiple contact points of laces with the ease and on-the-fly adjustability of hook and loop straps. The Technical Mesh upper is built from a custom monofilament fiber. This reinforced mesh fabric is welded to Teijin TPU film to give structure, support, and durability. 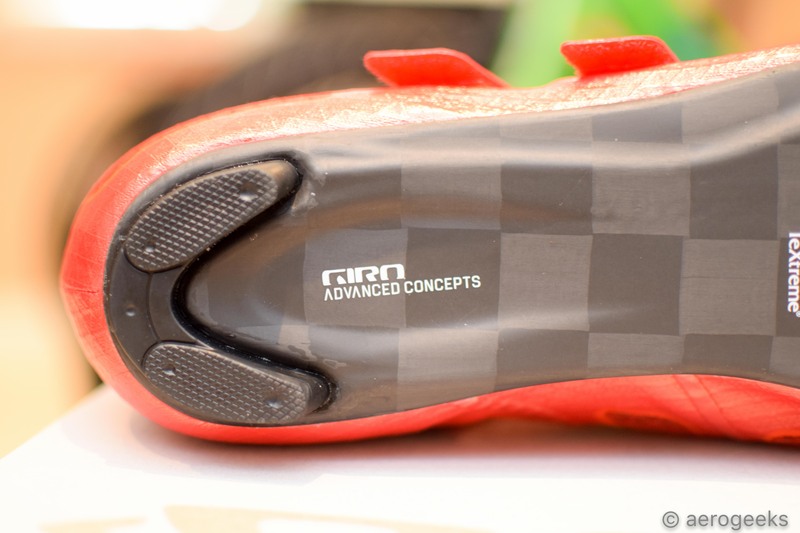 And the TeXtreme carbon fiber outsole uses a unique, flat weave that require less resin, allowing Giro to reduce the weight of their outsole by 22% while maintaining the same stiffness. 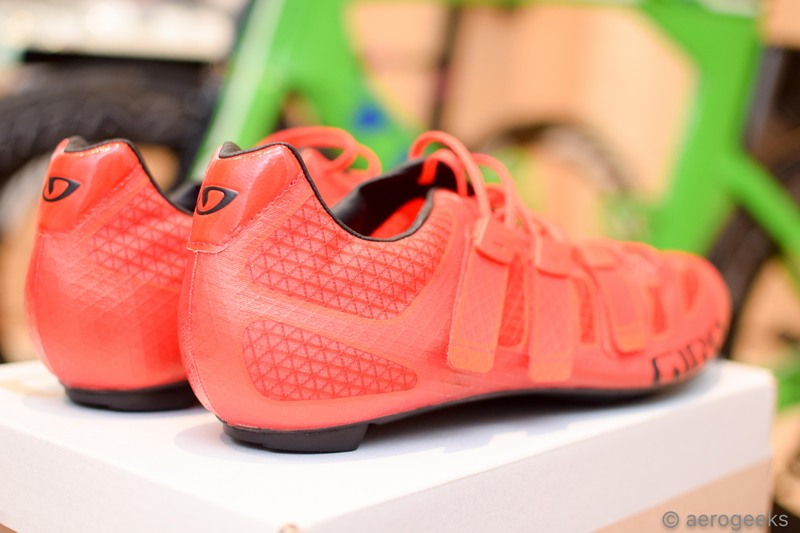 The result is currently Giro Sport Design’s most advanced and lightest shoe. A size 42.5 utilizing the non-adjustable ultralight footbed weighs in as little as 150g. The Techlace system combines the simplicity of Velcro with the adjustability of lace. By replacing D-rings and other hardware with laces, the Techlace system provides a more supple feel across the forefoot. The Prolight Techlace has three of the Techlace straps across the top. We found ourselves able to easily adjust the system mid ride, loosening and tightening different areas of the shoe as our feet changed over 100 miles plus. And while not as quick to undo as a one-strap Velcro or BOA system, we were still able to quickly and efficiently undo all three straps for quick dismounts. Unfortunately, the lack of a rear loop does make flying mounts a touch more difficult. We wouldn’t say it’s totally impossible, but you may want to consider sewing a small loop in if that is going to be your plan (although messing with a $400 pair of shoes makes us nervous just thinking about it!). While lightweight, the upper is more than strong enough for any riding (including some painful days on the trainer) we could throw at it. While there isn’t a whole lot of lateral stiffness (if you try to move your feet laterally, you will feel the sway), that didn’t affect how snug they felt throughout the pedal stroke. Out on the roads (in 90-degree-plus heat) we appreciated just how light weight and airy the shoes felt. Even with socks on, we easily felt the effect of the lightweight material and ventilation. As these are roadie shoes, we didn’t expect them to be developed for sockless wear. And the one ride we did sockless wasn’t as comfortable as we’d like…we found that the tongue dug in a bit into the top of our foot – but oh the ventilation! If we weren’t planning to go with socks for our upcoming 140.6, we would have attempted some possible tongue alterations. 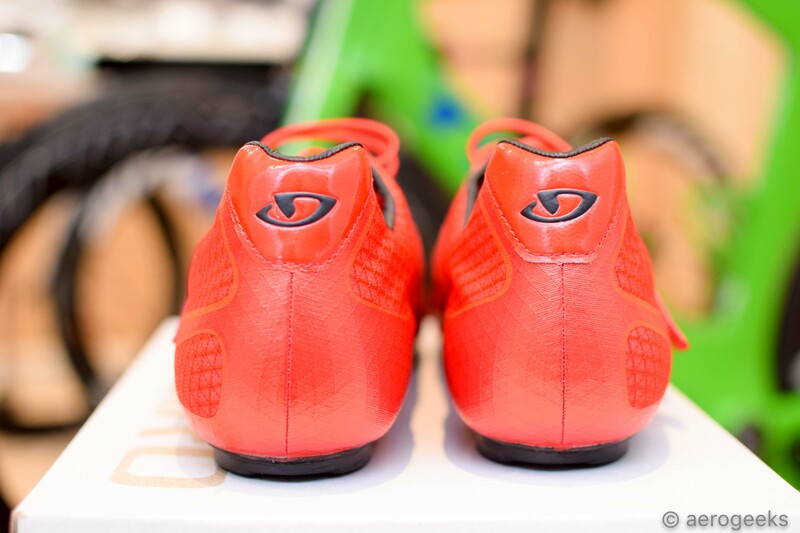 There is also a ventilation\water port on the bottom of the toe box that triathletes coming out of the water (or those getting rides in during the rainy season) will find to be an appreciated addition. The TeXtreme carbon fiber outsole is everything you hope it will be. It’s stiff – easily the stiffest shoe we have tested to date. It’s one of those shoes where you know every watt you are pushing down with is being transmitted to the crank. Frankly, it’s a “you can never go back” scenario. Because if you go back to a prior shoe that you had once considered stiff, you may be able to now detect the subtlest of gives. The outsole is attached to your cleats via titanium hardware (when we first read that, we heard Sir Richard Attenborough tell us that he “spared no expense”). At the back, the heel is unfortunately non-replaceable (we suspect to avoid the weight of another screw). The Prolight Techlace is available in three colors (red, white, and black) and sizes 39-48 with most half sizes available. We tested a size 47 (which is the size we have used with Scott, Louis Garneau, and Specialized). Pricing is a TeXtreme-stiff $400. We think this might be a shoe that long course triathletes will really embrace. Those going 56 or 112 miles might find its lack of triathlon-specific features are easily overcome with its light weight, extreme breathability, and the adjustability of the Techlace system. And that was the goal of our review – to determine if a shoe made for the mountains of France would be equally at home on the Queen K. And the answer is that if you are willing to spend the time putting on a pair of socks, we would answer with a resounding yes. We have been using the Prolight Techlaces in the run-up to Ironman Florida, now just a month away. Switching shoes just a few months before race day is always a little nerve-wracking. But for our readers, sometimes we must take the plunge. We found the shoes to be extremely comfortable throughout the entirety of our training. As we mentioned above, as the miles piled on, we were easily able to adjust the shoes as needed. The three straps are easy to adjust and reset – going from a BOA or single Velcro strap system – having three separate straps gives you a whole new ability to get the perfect adjustment. The ventilation is everything we have looked for in a dedicated triathlon shoe, and more. Of course, that also means that these probably aren’t the shoes we would be looking to grab in December in Colorado. They expel heat as fast as you generate it. Even with socks, we never found our feet to be warm or uncomfortable even as triple-digit temperatures approached at the end of our 100-mile days. 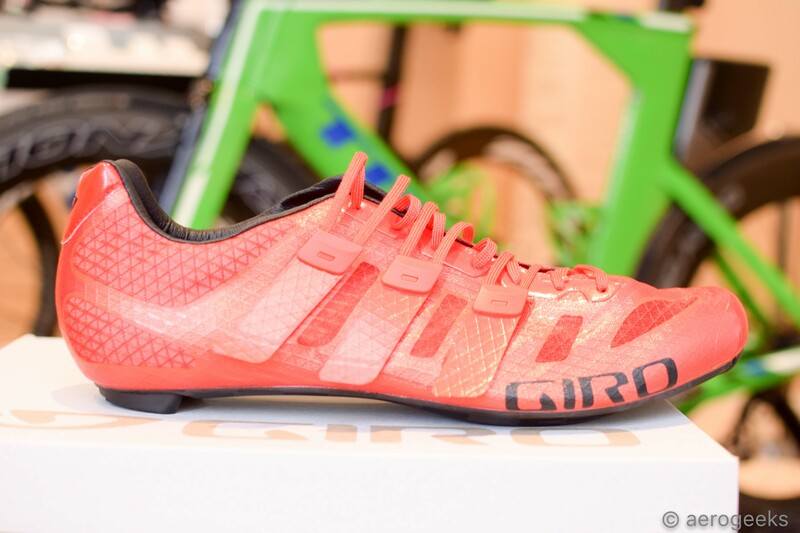 Giro includes both a non-adjustable, ultra-light-weight footbed and an ultralight SuperNatural fit kit. We have been using a SuperNatural fit kit in our previous shoes for a while now. So, the inclusion here was a welcome bonus. The kit comes with three different arch support options that are Velcroed to the bottom. 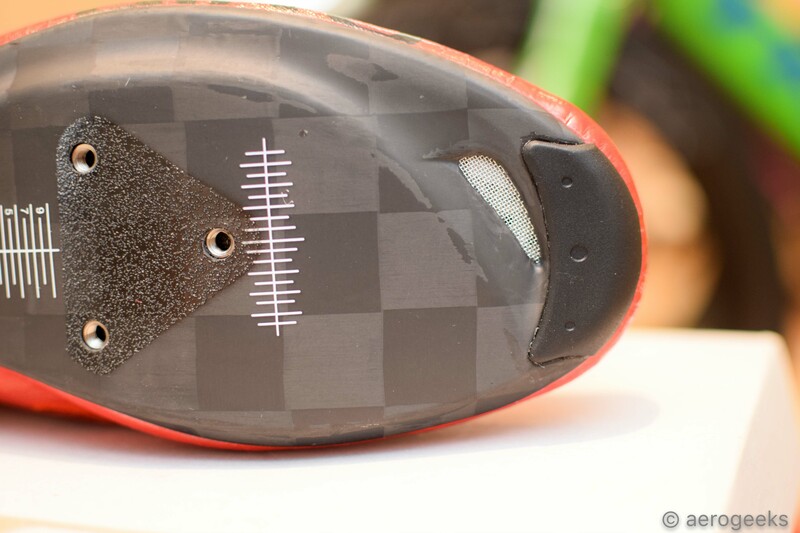 The penalty is a bit of a weight gain, but it really lets you dial in the fit that much better. The only downside of the shoes we could find is the price. $400 is steep – really steep. We know of only a few shoes that approach or exceed this territory. This isn’t a shoe meant for everyone. But when you are getting Giro’s best of the best – a price to match isn’t all that unexpected. 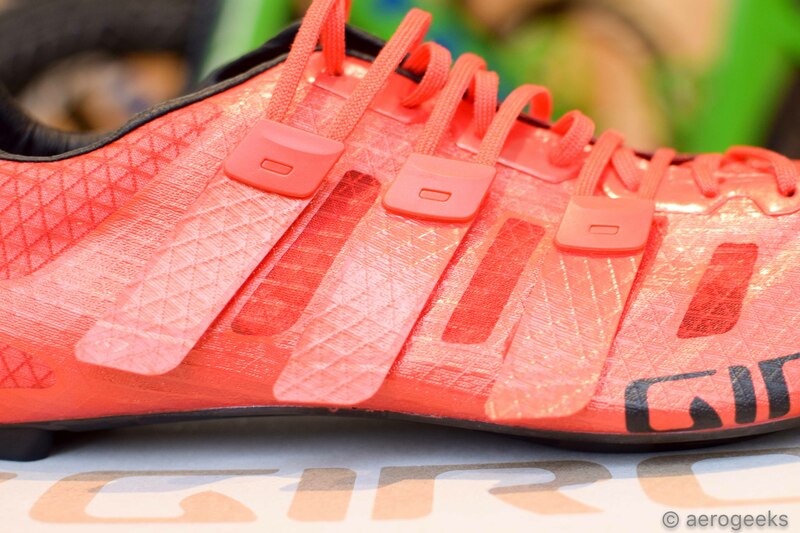 Is the Giro Prolight Techlace a long course option? Absolutely. For those looking for one of the lightest and best ventilated shoes out there, you don’t have to look much farther than this shoe. Yes, it is uber expensive – we know that and aren’t going to downplay it. 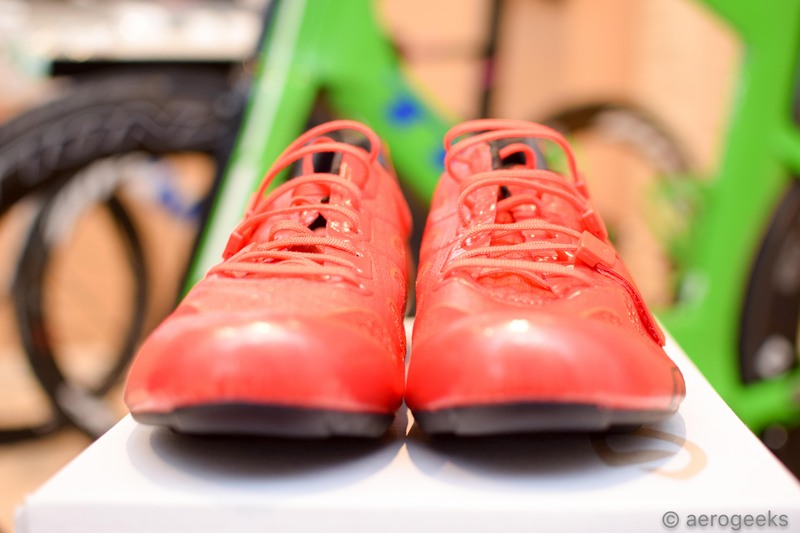 But after riding many a shoe, this is also the shoe you will find underfoot us at IM Florida in November (look for red shoes on a lime green Trek Speed Concept – Giro please, please make these in blue or green to match!) As we always say, our highest praise for a product is when we use it on race day. 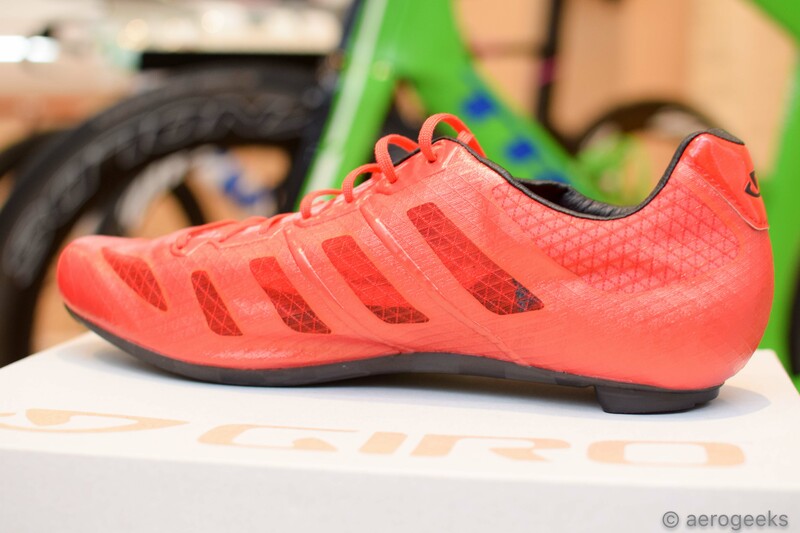 And on November 4th, the Giro Prolight Techlaces will be on an AeroGeek – that’s really all you need to know about that. 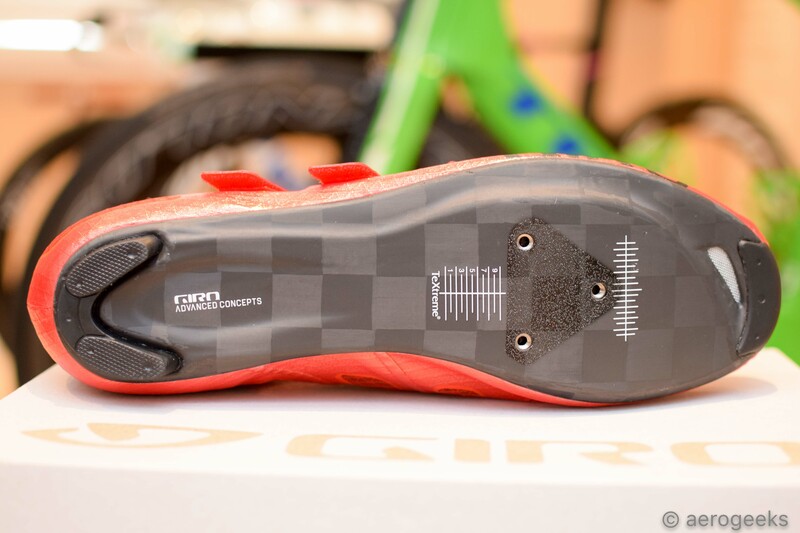 How does the sole compare to something like Giro’s EC90 plates? Hi George – unfortunately we haven’t ha a chance to ride with a shoe featuring the EC90 plate so can’t speak specifically to that. So how did they feel at IMFL? I’m thinking about picking up a pair of these babies! Anthony they were fantastic. Super comfortable for the long haul. As the foot changed over the miles was able to easily readjust the laces. Definitely the long course shoe we hoped it would be.